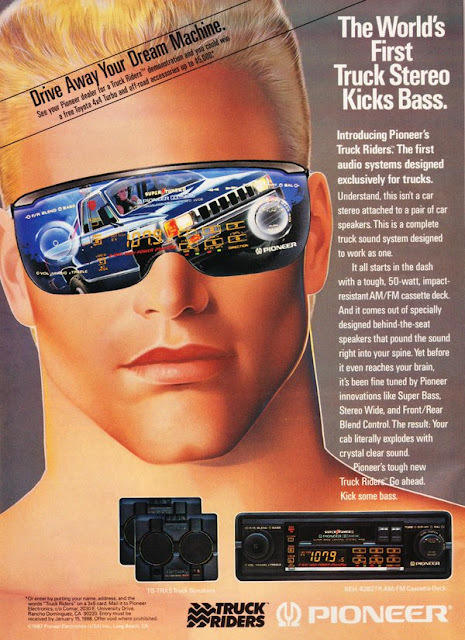 Pioneer Truck Riders Ad 1987: RETRO SUPER CRUSH! That dope flat top, those fresh shades, that killer jawline! Pioneer is truly outrageous in this magazine advertisement selling their Truck Riders truck stereo system from 1987. Who wouldn't want to be, or be with, this rad retro dude? He has to be the baddest, coolest airbrushed dream machine we've seen in decades! And that truck is pretty awesome too.